I have been hearing about the new Irish series on Netflix set in Northern Ireland and called “Derry Girls.” I finally got around to taking a wee look for myself and I am delighted to report that it is a brilliant show. “Derry Girls” is set in Derry City during the early ’90s. Having grown up a stone’s throw from Derry and having knocked around that city for the past few decades, I found the cast and storylines to be fiercely authentic and hilarious. I am including an interview by the Derry Journal with one of the main characters – Belfast actor Ian Mc Elhinney (who also stars in “Game of Thrones”). Ian plays the part of the Granda – a grumpy old sod who has no time at all for his son-in-law (played by Irish comedian Tommy Tiernan). The older man’s facial expressions and one-liners will leave you with near-permanent laugh lines. I would be very interested to hear how the series is being received in the U.S. and if American audiences have much difficulty understanding the Northern Irish accent. In full disclosure, I have a vested interest in this as I am currently contemplating converting my memoir into an audiobook and also have plans to write a series which will be set in Ireland and will include worldwide locations. Would love to hear your comments – in the meantime, here is Ian McElhinney’s interview with our local paper. I began watching a couple of weeks ago, and am enjoying every episode. After getting acclimated to the accent, I do my best to keep up with the quick dialogue. All in all, very entertaining. Thanks for commenting Jonathan. Glad you enjoyed it. I really got a kick out of it, especially having grown up in the area. Forget “LOL,” I was “BMAL” (Breaking my Arse Laughing)! I’ve had many a folk here in Canada tell me about the show and how much they love it. What I am finding though from other reviews online is that people are having a hard time understanding the Derry accent and are delighted that they have now introduced subtitles. It is nice to see things from home like this get international success! It’s smashing, Greg. I was laughing so hard (I watched 4 in a row), that I didn’t consider people would find it difficult to understand the accent, but later on, it hit me that it could be the case. I am really interested in seeing how well it is received in the U.S., as it will be an indication as to how our writing may eventually be embraced by a larger U.S. audience. Me. Sexton, you got me interested in watching the series and I will also let you know if I can understand their Irish accent. 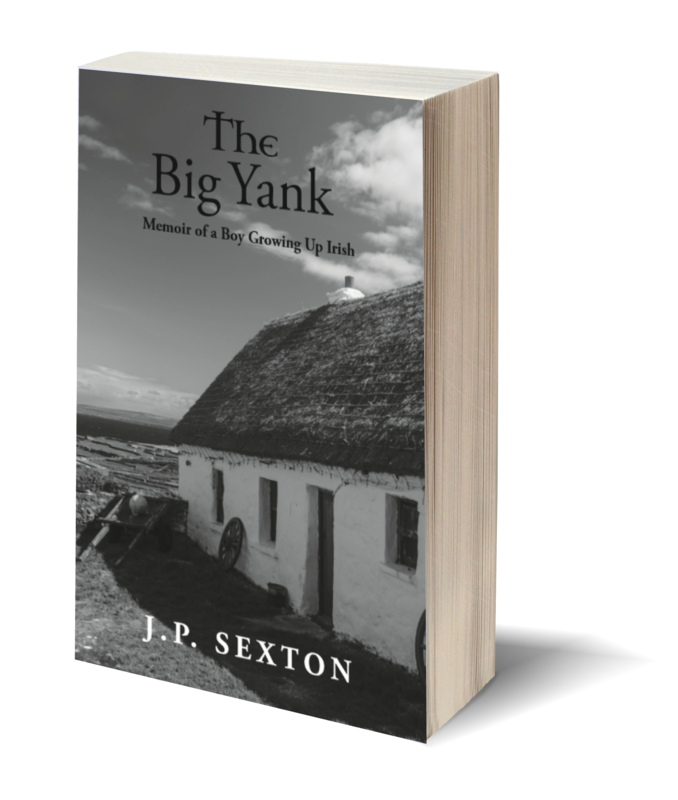 I read The Big Yank and I am looking forward to your next book, can’t wait! It’s a really good series, Ms. Martin and thank you for letting me know. The sequel to the Big Yank is finished and I am looking for a publisher – hopefully, it will be published before too long! In the meantime, my latest book came out on the 1st of July. It is called; “Four Green Fields – Wild Irish Banter & Stories. Shenanigans & Poetry.” It is co-authoured with Greg McVicker and Mark Rickerby. It contains a lot of crazy stories of our three Irish families and we have also included our own personal poetry. I hope you enjoy it! Speaking for this American who loves all things Irish, I absolutely loved Derry Girls. Sat and watched the entire season over a weekend. I have been to Ulster several times and I didn’t have any issues with understanding things, but I never had a problem understanding anyone during my Irish travels. I love the 2 main male characters. They are my favorites. So many great characters in this show and interesting scripts. My favorite episode was where they were leaving Derry to get away from the marching season. I’ll recommend it to my friends and I will help them out with any necessary interpretation. Thanks for letting me know, Kristine. So far it seems to be a hit with everyone who has viewed it.